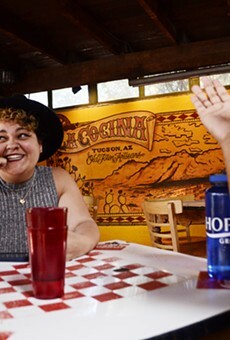 Tucsonans have a love affair with dining al fresco. What makes Blue Willow the quintessential favorite year after year has to do with perception. The sides of the patio are enclosed with thick green vines and potted plants abating parking-lot fumes and noisy traffic whizzing by. Overhead clouds roll by on the other side of a finely hewn screen, so there's a slight layer of protection between you and the harshest rays. If the skies should roar and spew forth mighty rains, a cover can be rolled over the top; though it occasionally leaks here and there, diners don't seem to mind. Hot or cold (fans or heaters), wet or dry, everything seems right with the world during that moment in dine time. Vote of note: "too hot right now to eat outside"